Halloween is one of children’s favorite holidays to dress up and get candy with trick or treating and one of the most popular places to go trick or treating is at the mall. Fortunately, Orlando has several indoor and outdoor malls participating with Halloween trick or treating in 2018 where you can experience a safe Halloween and beat the weather if it is not cooperating with rain and you are looking to have a dry Halloween. This is our list of Orlando Area Malls having Halloween events on Wednesday, October 31st, 2018. Many of the malls have similar rules in that they request that children 12 years old or older not wear any kind of masks and to not bring any kind of false weapons as a prop. Most of the mall stores will have some sort of icon, particularly a pumpkin, to identify the store as a participating merchant to receive candy. The Orlando indoor malls participating in trick or treating include Florida Mall with trick or treating from 4 PM – 7 PM that has had entertainment in past years including a stilt walker, balloon artist, and face painter. Oviedo Mall will have trick or treating from 4:00 PM until 6:00 PM. Seminole Towne Center will have their Halloween event from 6 PM – 8 PM that will feature fun and games for families. Fashion Square Mall has had trick or treating in years past as well. We will update this article as it gets closer to Halloween. On Halloween night, there is a Halloween event for children at Shady Park in Hannibal Square from 6:30 pm until 8:30 pm called Pumpkins & Munchkins with games, bounce houses, a costume contest, and a Trick-or-Treat Trail. 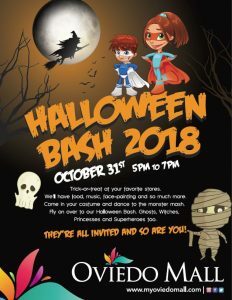 Adjacent to Altamonte Mall in Altamonte Springs, the outdoor Uptown Altamonte will have their merchant tents setup for one of Orlando’s premier Halloween events for kids to do trick or treating from 5 PM – 9 PM with a costume contest at 6 PM. The Orlando Premium Outlet Malls on International Drive have had trick-or-treating on the Saturday prior to Halloween in years past from 12pm-5pm. Check back here closer to Halloween for more up-to-date information. Some Publix supermarkets will also be participating in trick or treating this year. Click here for more information. This entry was posted in Family and tagged activities, colonialtown, fashion, halloween, international drive, october, orlando, oviedo, sanford, shopping, waterford lakes, winter garden, winter park. Bookmark the permalink.